Rocks Locks Locksmith & Security Service is a local, family-run locksmith company who has very quickly established itself as one of the best local locksmiths who provides great value for money and an exceptional level of service. 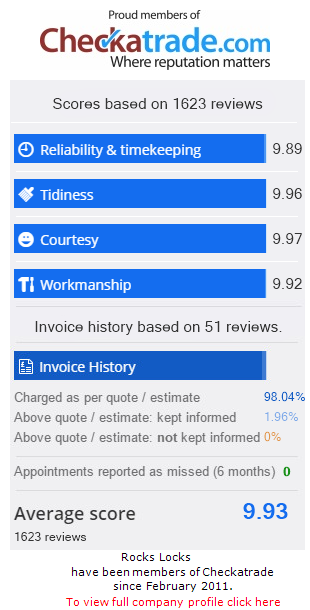 Take a look at our Checkatrade reviews to find out what our customers think of the service provided by Rocks Locks in Camberley, near Sandhurst. Locksmith services in Sandhurst include fast emergency response, lock repairs, replacement locks, access systems, installing safes, window and door replacement, alarm and CCTV installation, insurance claim survey reports and security advice. Rocks Locks Locksmith & Security Services serves homeowners and businesses in the Sandhurst area, and being only a mile from the Rocks Locks base in Camberley, Stuart can provide a fast and efficient emergency response should you require an locksmith urgently due to being locked out of your home or business premises or for some reason, you can't gain access to your property.